Researchers at Utah State University don't need an Apple Watch or stethoscope to measure your heartbeat. They only need a video camera. Professor of electrical engineering Jake Gunther and his former student Nate Ruben are the inventors of a USU-patented technology that estimates heart rate using a video camera and specialized software. "When your heart circulates blood through your arteries and veins, the light absorbed by your skin changes by measurable amounts," says Gunther. "You can't see it with the naked eye, but when our system processes the images from a camera, the changes are obvious." Video cameras record images in values of red, green and blue. The green channel provides information that makes heart rate estimation possible. "Hemoglobin in the blood has an absorption peak for green light," said Gunther. "So when the heart pushes blood into arteries near the skin, more green light is absorbed and less is reflected. This means we see fewer green values in the images from the camera." The system processes the color data and computes an average over regions of the image where skin is visible on the face, neck or arms. This contactless monitoring system could revolutionize medical equipment and consumer products including baby monitors and exercise gear. A future version of the inventors' design could even replace hospital tools that monitor blood pressure or blood oxygen levels. "The operation of our system is similar to a pulse oximeter," said co-inventor and USU alumnus Nate Ruben. "But instead of looking at the light transmitted through skin tissue, we're looking at the light being reflected from it." The idea for the heart rate estimation technology came when Ruben and his wife had their first child in 2012. Like most new mothers, Ruben's wife constantly checked on the child as he slept. All those trips to the crib gave Ruben an idea: make a better baby monitor. At the time, he was experimenting with a similar concept that used webcams to estimate heartbeat. But the technology faced a hurdle: sleeping infants don't hold still, meaning the camera captured competing signals due to motion. Ruben and Gunther, however, say they've developed a way to extract the signals they need. "We have a technique that allows us to separate those fine details," said Gunther. "We've done this, we've pulled it off." 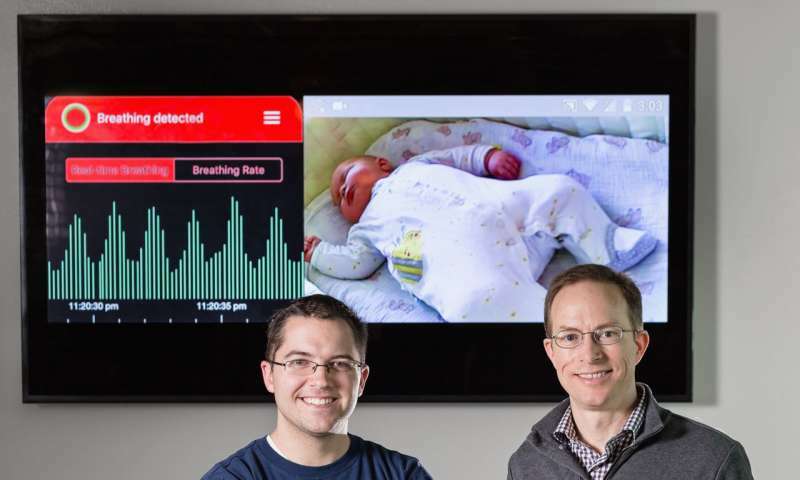 The inventors are expanding their patented technology with the creation of a new company called Photorithm Inc. Gunther and Ruben are also developing a new baby monitor system called Smartbeat that uses similar software to detect breathing in a sleeping infant. They say the technology will be a game changer.